Breyden Erickson set out 9 weeks ago from Horseshoe Bay in West Vancouver BC on a mission to walk across Canada to raise money for cancer research. His geographical progress has been incredible, (he should be in Saskatchewan by tomorrow!!!) but we need help with his fundraising goal. This 18 year old young man is doing an incredible and selfless thing to try to help others. Please take a few minutes and make a donation to his Canadian Cancer Society fundraising page. He is currently just west of Medicine Hat and will be at these southern Saskatchewan communities on the following dates.. well estimated, depending on weather and other conditions. He is WALKING after all. Watch for him and the support vehicle and stop by and say hello. 1 Percent of funds have been raised to date towards Breyden’s goal of $323,323.00. C’mon Canada, we can do this! Parks for the great RV site! 5 Mayors met to date. 15 Kilometers walked along the Fraser Canyon by Alex, Breyden’s 10 year old cousin, on April 7th. 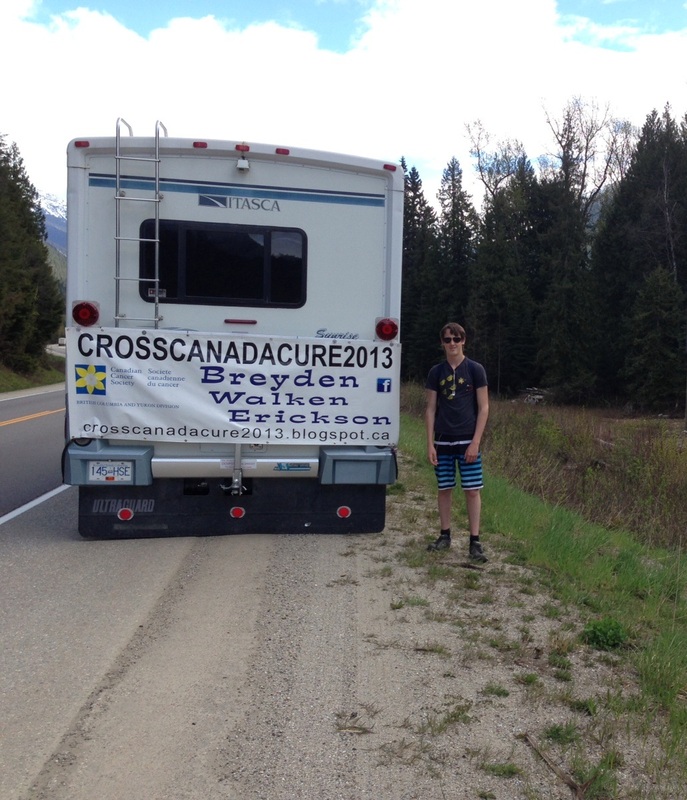 26 Days since Breyden’s “Team” started travelling with him in the Cross Canada Cure RV. 213 Total Blog views so far today! 220 Dollars received for scrapping Breyden’s car, to helping fund his walk. Breyden and the TeamBreyden road crew.